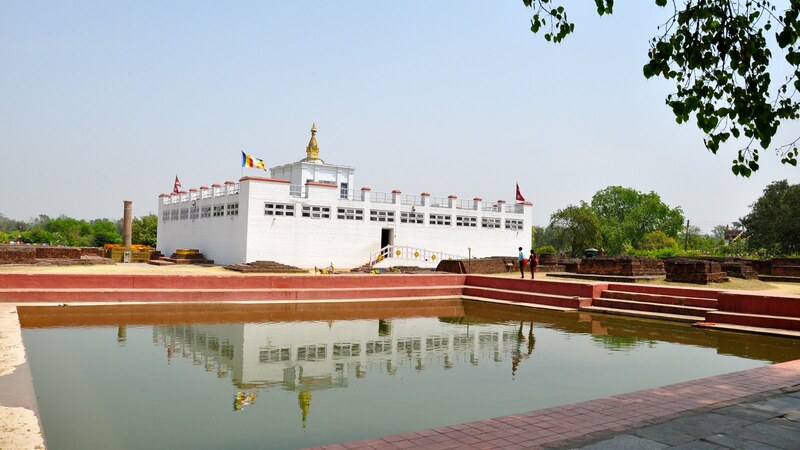 Lumbini Tour | Adam Tours & Travel Pvt. Ltd. The Lumbini is one of the ten world sites for religious pilgrimage and sole source of worlds one of the major religions–Buddhism and the source of world peace and prosperity, and no doubt one of the places to be visited in your lifetime. Lumbini, the birth place of Lord Buddha, is one of the most popular destinations for the worlds over one million Buddhists, It does not mean it is only popular for Buddhists religious people but also popular for any individual searching for peace and serenity in life, It is located in the south-western Nepal, in the Terai (plain-land), approximately 300 km away from Kathmandu, Lumbini tour is one of the frequently organized trips by team of Adam Travel. Some 2,600 years ago, approximately in 566 BC, Siddhartha Gautam was born in Lumbini while his mother Maya Devi was on her way to her maternal home for the delivery, the holy book also says that Maya Devi feeling the onset of labor pains, she grabbed the branches of a shade tree and gave birth to Lord Buddha then, Immediately after birth, the Buddha is said to have announced that it was his final rebirth and took seven steps, under each of which a lotus flower bloomed, Siddhartha Gautam, was prince of Shakya King, who said to have ruled in central Terai from their capital at Titaurakot, later on had attained the enlightenment, at which time he became Buddha, (released from the cycle of birth and death), the sole source of the world peace and prosperity. The Lumbini arguably has been world most important historical site and therefore why UNESCO even listed Lumbini under the lists of world’s heritage sites in 1997, and equally, it has been also the source of the one of the world’s great religions and the centre of country’s most significant archeological discovery, dating back from the third century BC. BBC travel team lists Lumbini, as one of the worlds 10 sites of religious pilgrimage. An estimation puts that nearly 100,000 travelers make it to Lumbini every years, this shows that how important and popular in the universe. There are a number of ancient ruins of Buddhist monasteries, a sacred Bo tree, and a sacred bathing pool, called Puskharni pool, where Maya Devi had taken a bath before giving birth to Gautam Buddha, Maya Devi temple, scared garden spread over 8 Sq km, Ashoka pillar to name a few the Lumbini is situated in the foothills of the Himalayas of Nepal, which houses a large garden with a grove of Pipal trees, and the area is full of a number of religious and cultural sites, Buddhist temples and shrines from various nations are scattered around the holy site itself. But, the most important temple is the Maya Devi Temple, which enshrines the traditional site of the Buddhas birth. Adam Travel has short 6day tour to Lumbini and the tour even include your arrival and departure and a day tour in Kathmandu valley, look the detail itinerary how the tour goes. Visiting the Lumbini- the place where the Buddha was born. On your arrival in the Kathmandu airport (TIA) you will be greeted by a representative from OUTFITTER NEPAL, after completing your custom formalities (Visa, etc) pick up your luggage and look for our rep with an Outfitter Nepal display board at the arrival gate, you will be then transferred to your hotel. After check in, you can take a rest, go for a stroll down the road & get familiar with your surroundings – it all depends upon your interests and how good you feel after all the jetlag and overnight at hotel. After having breakfast at hotel, today we pay our visit to Boudhanath Stupa, one of the largest stupas in the world and an important Buddhist pilgrimage site, the unique octagonal Mandala design with hundreds of prayer wheels and the 108 images of the Buddha set into the niches around the huge structure, The area of Boudhanath is also famous for over 50 Tibetan Gompas or monasteries, & also known as the ‘Little Tibet’, the Kapan Monastery at Kapan Hill, a few kilometers higher north from Boudhanath is also known as Nepal Buddhist Mahayan Centre, Kapan Monastery follows Gelug tradition of Tibetan Mahayana Buddhism under the guidance of Lama Zopa Rinpoche, there is also a nunnery nearby the main monastery, known as the Khachoe Ghakyil Ling Nunnery, home to about 400 nuns, return to hotel and overnight at Kathmandu. After having breakfast at lodge, we drive to Lumbini today, to south-west from Kathmandu which takes about 7-8 hours, we say adieu to the ancient valley, and head toward the flatlands of Nepal’s teeming Terai, Generally, the weather gets hot and humid in the plains except in the winter. Perhaps, Lumbini is the most important Buddhist pilgrimage site – the place where Buddha was born. In case we reach Lumbini around sunset time, we can stroll around in the local market to have a glimpse of local lifestyles hereabouts and overnight at Lumbini. After having breakfast at hotel, we take you for the full day tour in Lumbini and the Lumbini is one of the world’s major religious, architectural, and historical sites. We devote our time today in visiting as many places and sites in Lumbini as possible. The place is really a big area with monuments, temples, and ancients sites making it a UNESCO World Heritage Site. First we visit the Mayadevi temple which is built on the exact place where Buddha was born. We spend some time wandering around the gardens, some of the important landmarks and monuments in Lumbini include: Ashoka’s Pillar erected by Emperor Ashoka (249 BC) on the spot of Buddha’s birth which also has the oldest inscription in Nepal. There are many Buddhist Temples founded by the devotees from different countries: they include Tibetan, Chinese, Japanese and Burmese, Korean, etc. and overnight at hotel. After b/fast, you have free time to see around and drive the same road back t Kathmandu and overnight at hotel. At OUTFITTER NEPAL, we always strive to give you nothing less than the best. We are confident that you’ve enjoyed one of the best holidays ever & will go back home with lasting memories of this amazing country. Our escorts & vehicles will be on standby at your hotel to take you to the airport for your final departure home sweet home. It’s been wonderful knowing you. We hope to see you again!! Bon Voyage!. Three night’s hotel Kathmandu including breakfast. Two nights Hotel in Lumbini including breakfast. All the Transportation Sightseeing in the Kathmandu valley and Lumbini by private tourist vehicles. Food (Lunch & Dinner) during the tour.